20557 NETSP2316.jpg 500X638\NETSP2316.jpg Send A Hint! 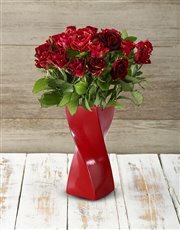 Product Description: less text Cast a spell on the one you love with this Hocus Pocus Rose Arrangement! 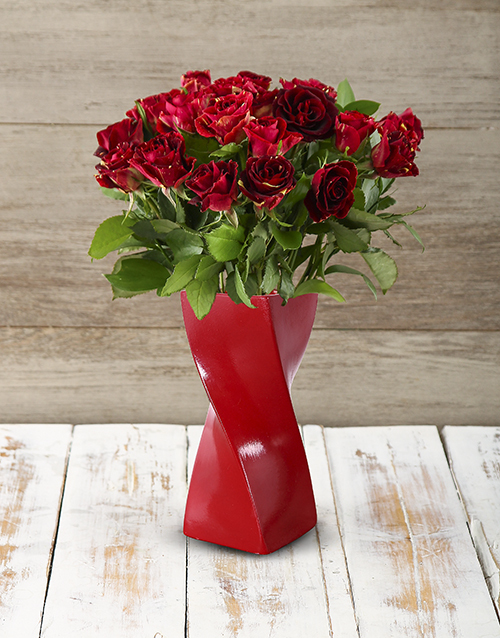 With 24 Abracadabra roses and ruscus in a coloured twisty vase, your loved one will know your sweetest sentiments, without you even saying a word! It's like magic! Offering a spin on the classic red rose, these beautiful and enchanting roses will definitely make your lover swoon! An absolute sweetheart of a rose, the Abracadabra rose is a very generous type of flower as they last longer and they open beautifully to display their colours in the best way! Surprise them for any special occasion and send this Abracadabra rose arrangement with NetFlorist today! Abracadabra Roses get their name from the magical way they bloom. These roses arrive curled up in tight buds, but with a little time and magic, abracadabra! Their gold-speckled petals open up generously! Get this Hocus Pocus Abracadabra Rose Arrangement delivered with NetFlorist.